The K-12 Digital Learning Revolution Program is the work of 70+ IMS Global Learning Consortium member school districts and state departments of education—representing over 11 million students—with substantive experience and knowledge about what it takes to implement and scale integrated learning technologies. It’s called the Revolution program because it enables both a straightforward evolution to digital and provides the foundation for making significant—revolutionary—advancements in teaching and learning. Your district does not need to be an IMS member to be a part of the digital learning revolution. But you do need to make the commitment to purchasing IMS certified products in order to establish a plug-and-play ecosystem. We're here to help! Connect with an IMS K-12 Institutional Program Manager to discuss your district’s needs. Or explore the program tiers below to learn more. 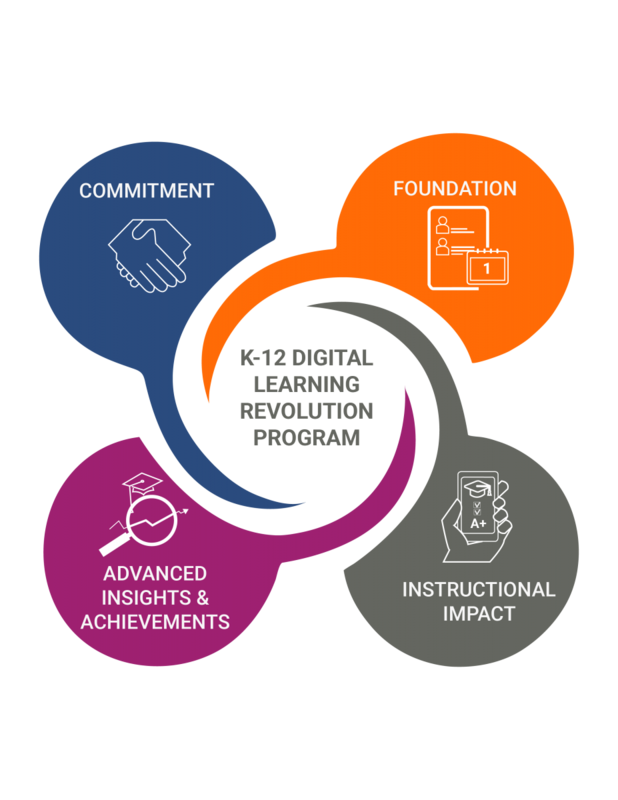 "Districts who want to improve the usability of their educational technology should consider the IMS K-12 Digital Learning Revolution Program. Each tier is customized to the needs of a district and the program continues to evolve as a district becomes more advanced in their use of open standards. IMS Global Learning Consortium provides the support and resources to ensure successful implementation at all levels of the program. The opportunity to network with other districts is also highly beneficial." Special thanks to Contributing Member Zia Learning for producing this video. to purchasing products guaranteed to meet IMS Standards for which they have passed testing. What does this Enable for Your District? The School District of Lee County (FL) has focused on changing their procurement practices to achieve student-centered learning. See how they are achieving a seamless plug-and-play ecosystem. The K-12 Statement of Intent to adopt IMS Global Learning Consortium Standards provides sample RFP language to use when negotiating with suppliers to ensure the adoption and support of the most current IMS standards. View more success stories, helpful resources, and tips to help you navigate making a commitment. What is the Next Step for Your District? Save time and money while provisioning users and automatically authorizing software applications. Establish a trusted connection between applications for ongoing transfer of data while providing a single sign-on user experience. Learn how Gwinnett County Schools’ strategy for a seamless digital ecosystem is allowing them to be digital on day one of learning. View more success stories, helpful resources, and tips to help you build a Foundation for your digital ecosystem. Choose and switch as needed in an evolving and changing suite of providers by ensuring that content and data are easily transferred among systems. Ensure data integrity by removing the need to manually re-enter assignment scores from various tools into the gradebook. Integrate multiple sources of digital curriculum, learning apps and tools, and assessment products. Access to discrete learning objects and assessment items in the right place at the right time. Provides a means for collecting assignment scores and grades across a wide array of digital resources in a single place of record. Enables the integration of a variety of summative and formative assessment products, including third-party item banks, to provide educators with actionable data to inform student interventions and instruction. Katy Independent School District has established a plug-and-play ecosystem that has revolutionized the district's digital learning environment and allowed them to integrate content from multiple sources into their learning platform. View more success stories, helpful resources, and tips to help you increase Instructional Impact in your digital ecosystem. Understand and visualize product usage data from different sources and present this information to students, faculty, and advisors in meaningful ways. Ensure easy data aggregation for items aligned to learning standards by implementing a universal identifier across all products. Quickly and securely integrate badging platforms with other systems without doing custom integrations. Simplify record-keeping and transmission of digital student records. View students’ product usage to better understand the return on learning of technology investments. Provide educators a faster and more reliable way to align and realign content to learning standards, find and share content from different sources, and support the transition to standards-based and competency-based learning. Present achievements that are verifiable and portable to help learners differentiate their career-readiness in an increasingly competitive world. Improve the institution’s ability to digitally represent and report a learner’s academic and co-curricular record, and make it easier for the learner to share their achievements with prospective employers. New teaching and learning models require tighter alignment to academic standards and competencies. Learn how the Georgia Department of Education is developing a digital ecosystem that will blend traditional, virtual, and personalized competency-based learning using IMS Global standards to deepen the understanding and insight into student learning experiences. View more success stories, helpful resources, and tips to help you gain Advanced Insights into student achievement and performance against standards.